I feel like I have been circling around this topic since I came back from my yoga teacher training. I have been feeling a strong urge to get everything back on track and to be a bit more serious about my goals. It isn’t that I have been completely neglecting my goals, it is that I have been having a challenging time figuring out what they are. I am sure this happens from time to time for everyone but figuring out how to get back on track is what seems to be the tricky this time around. I have been doing great at setting weekly goals and sticking to them. However, I feel like I am lacking that “big picture” goal and not to be dramatic but it is making me feel a bit empty inside. Beside setting a super vague “to be as healthy as I can be” or to “keep up with my physical fitness” type goals I have been having a pretty rough go at focusing my intentions on something for the year. It doesn’t help that I have been having knee issues and I am slightly bored with my current workout set up, but I feel like these two challenges could be seen as advantages in goal planning, my brain just isn’t picking up on what to do with all of it yet. With all this whining and feeling slightly lost aside I figured if I can’t do it on my own, it is time to bring in some professional help. Although I am a certified personal trainer and yoga instructor sometimes we all get stuck and pulling ideas out of a second brain is exactly what we need to get refreshed and recharged. So I met with my trainer. It was great to get outside perspective on my workouts and to be asked to figure out what I would like to achieve and how I would like to go about it. Sometimes all it takes is being asked the same questions in a different manner. I think I still have some work to do to figure out exactly what my goals are (workout, life, career) for this year, but I feel like I have been refreshed and can start looking at it all with a new set of eyes. Now with new eyes, new exercises and some new recipes to try I am excited to sit down with my pen and paper and write out some new concrete goals. Have any of you had this same struggle? Where you feel like you have been doing something for so long it becomes almost mechanical and you have lost sight of what your goals were or are? 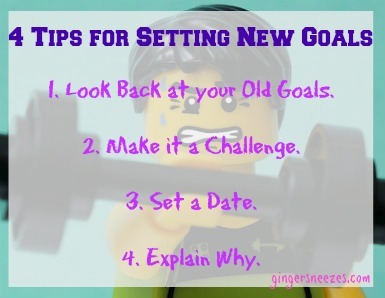 This entry was posted in General and tagged Goals, gym, Personal trainer, stuck, teacher, yoga by healingginger. Bookmark the permalink.